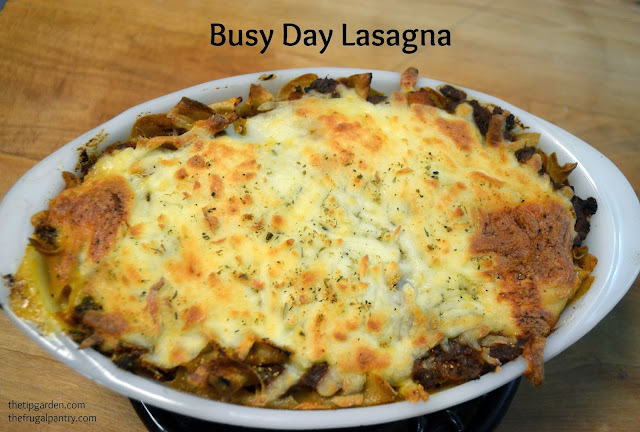 This Lasagna style dinner is a perfect go to recipe when you need something yummy to do with leftovers or to take to a sick friend. I first came across this dinner when a dear friend brought it to my family as a dinner many years ago when I was recovering from surgery. I have been the beneficiary of this delicious gift several times through the years, and it never disappoints. When she shared the recipe in a church cookbook, I just kept right on making it! I have always made spaghetti sauce in huge batches, and then repurposed some of the leftovers into several other meals, like Pizza Subs as well as todays recipe. Jan's Tip: The recipe original calls for rigatoni pasta, but I use what ever I have on hand. My husband prefers "flat " pasta over tube pasta, and I had half a bag of whole wheat egg noodles to use up today. Just grab whatever you prefer. Today I am making only half the recipe since it's just me and the hubby, but the full recipe should feed a family of 4-6 easy. Arrange half the pasta in the pan. Repeat the layers, ending with the cheeses. Bake at 375° for 20 min. till warm and bubbly. What do you do with your leftover Spaghetti Sauce?